Greetings to your, honored Reverend Tony Raker! I apologize that I have been remiss is writing you, but I am tiring as I age. God has blessed me with 80 years on this earth and I am grateful that He lets me do His fine work planting seeds for salvation. How are you and your wonderful wife? How are your boys? I understand they are in wheelchairs from your photos on your website. I pray they are doing well. And I see you are absolutely blessed with your young grand daughter, Lorilai. Her painted face on the website is very cute. Do you not also have a grandson? What is his name? Perhaps you can post his picture on your website soon as well. Life is good in our village. My grand children have peaceful school classes and can lay in the fields again. We see many military vehicles go by our village as Russia is now providing T90 tanks to join the American, British and French armored vehicles that have defeated Daesh. I am showing your sermons using my thumbdrives. A government official tried to confiscate them but we hid them so they could not be found and brought them back out to share with the lost here in Iraq. Jehovahs Witnesses from Russia also tried to get me to turn them over to them for destruction as they want no competition with their perverted teachings. I shared with them one of your Issues & Answers, much to their dismay! They are not happy with me but are staying away for now. We are all healthy and well-fed for some time now. We have restored our village so everyone has a home. The building we use for our church was completed before all other buildings as it is our rock on which all else is built. Our flocks are producing good lambs and little goats again. We planted a crop of wheat last summer and expect a good harvest in June. We have 10 hectares planted this year! I think that is 25 acres in America, yes? It is necessary for our bread. Please continue to pray for us. We are healthy and doing well though I am very tired and unable to move around as much as I used to. I share God's word, especially your recent sermon on Jesus equals Truth. I am trying to help others with Issues and Answers but it needs to be reorganized as it seems haphazard in which sections titles reside. We look forward to the Lord's soon coming. Many here are angry with God for the troubles our land has seen, but I share with them Exodus 23:20 where we are told not to provoke Him, but obey Him. It is about trust and all things in His time for our reward is not on this earth and we absolutely cannot understand His plan. This is but a testing ground so one would be wise to follow His instructions while on this earth. After all, even Lucifer and his devils acknowledge the Lord's power and even his plan. They just refuse to bow to Him and stalk the land seeking disgruntled people to lead away from salvation. It appears to me that mankind has used the knowledge they gained from the apple poorly and without complete understanding, they rely on their own judgement. That is why I think there are so many problems in the world today. Human judgement is flawed without God's guidance. I pray He returns soon to bring on the era of peace on earth. My wife is calling me to our mid day meal. I must leave you now. Please pass my hearty greetings to your wonderful warriors in your church. I pray for you all often. In Christ, Peace be upon you and your house. Hello my brother! So good to hear from you - thank you so much for the update as we know better how to pray for you, your family and the community. I so admire your walk and stand for the Lord Jesus! Glad to hear of the rebuilding and how God is blessing. Be assured of our continued prayers! Please pray and bless the Finnish nation. The enemy is trying to take control of the leadership of our country. It seems like the people have become blind to the works of the enemy. Churches seem to be sleeping. Please pray over our nation! In 10 days we have elections. Pray that God will provide Finland with a Christian leader. Thank you! God bless! Tuija: Thank you for your prayer request, most assuredly we join you in prayer for Finland…and ask that you join us in prayer for America and our leadership as we are instructed in 1 Timothy 2:1-4. Historically, the U.S. and Finland are most certainly “Christian.” But culturally, speaking of the U.S., we absolutely are not “Christian” in terms of current attitudes and behaviors. Neither the U.S. nor Finland is under obligation to keep a particular worldview. Nor are we guaranteed to maintain any sort of connection with our Christian heritage. History cannot be changed, but the decision of whether or not the U.S., or any nation, will exhibit a Christian worldview will greatly impact the continuation of its particular form of government. Whether the U.S.’s constitutional republic survives, experiences drastic change, or fails entirely depends on the conviction of its people – as it does with the Finland. When those in authority are obeying the will of God, it is easier to “live peaceful and quiet lives in all godliness and holiness” (1 Timothy 2:2). Hence, I join you in prayer! Please pray for me. I recently got out of a long-term relationship with a man who was very cruel and abusive. Leaving that relationship left me homeless and without a car. The place that I found that I could stay at temporarily is not a good environment. There is always a lot of noise, tension, chaos, cursing and slamming doors. It wreaks havoc on my PTSD, which is a result of the abusive relationship I was in. My only income is my disability, so I am finding it difficult to find an affordable place to live. I constantly feel unsafe here. I spend a lot of time in my room by myself, which helps alleviate some of the tension; but it does not help with the noise, slamming doors, and very loud cursing. I don’t have a car, so I can’t go anywhere. I feel like a prisoner. It is really taking a huge toll on me. Every day, I feel more and more defeated, discouraged and depressed, even though I spend time in Bible study and prayer every day. I am spending more and more time wishing that I were dead. Please pray for God to give me a quiet and safe place to live, a car, and healing. My name is Cynthia. I am also requesting prayer for the man who was cruel to me and abused me. People say that I should hate him because he is evil. I know that although what he did to me is evil, he is not evil. He is a person who does not know Jesus as his Savior, and has no one else in his life who gives him Godly counsel and speaks the truth of God’s Word to him. I no longer have any contact with the man for my safety; but I still would like for him to come to know Jesus as his Savior. Please pray that God will send Godly men into his life; and that the Holy Spirit will convict this man and draw him to Jesus. This man’s name is Franklin. Thank you so very much for your prayers. I truly appreciate them. Strong Holy Spirit filled prayer desperately needed over Juha! He is under heavy persecution and has to face public slander. May God conquer Juha’s enemies hearts with His powerful love, and silence their evil tongues. Bless Juha so he can see and feel how Heavenly Father protects and guides Juha with holy wisdom. May Gods favor follow Juha where ever he goes and whomever he meets. May heavenly light shine from Juha and he will win whatever obstacles come along the way! Please pray for me as well for I have suffered for 13 years of a painful lump in my gum. The pain can get so bad it prevents me from speaking and eating. The pain overwhelms my whole being and my head feels like it’s filled with thousands of bees. I’m a widow with two lovely daughters but I am alone. Please pray that I would be able to forgive past wrongs I have faced and be set free from bitterness. Depression tries to haunt me but I put my faith in the good Lord! May He heal my damaged legs and hands as well. Thank you, Tuulikki, for your prayer request. God is still “the LORD who heals” (Exodus 15:26). He has not lost His ability to heal, and His love for His people has not diminished. Divine healing may come through traditional medicine or through direct intervention by God in response to prayer. Or, if God wills, wholeness may not come until the ultimate healing in heaven. God is the Great Physician, and all healing, physical, emotional, and spiritual, belongs to Him. Hebrews 12:15 warns us to “see to it that no one misses the grace of God and that no bitter root grows up to cause trouble and defile many.” We must always be wary of allowing “bitter roots” to grow in our hearts; such roots will cause us to fall short of the grace of God resulting in depression. God wills that His people live in love, joy, peace, forgiveness and holiness—not in bitterness. Therefore, the believer must always watch diligently, quick to forgive as Christ forgives us, being on guard against the dangers of bitterness. I’m praying for you!! Senor Raker, I am thankful for your broadcast today. As you know, my country is currently undergoing severe struggles with lying from our government and their gangs and the people are very angry. I heard about your broadcasts from my sister in Idaho who knows Rob, your tech guy. Rob has been a good friend to my sister's family for many years. Her children love him very much and call him uncle Rob since very young. We are all enduring hunger, darkness and persecution here waiting for the government to finally fall. As long as the socialists remain in control, we deteriorate even worse than the day before. They have badly mismanaged our country. Please pray for us. My wife's mother has taken our children to Columbia where they get food from the UN and US charities. My wife and I hope to join them soon, but my mother is so ill, it is difficult to leave him now. Please pray for us! We need strength, food, medicine, peace and help. Pray God moves to remove the government before US president Trump rashly attacks us. War is not the answer, but Mr Trump is so rash and unpredictable, we are in great fear here. Please pray a path will open soon to save our country. Florence is in the hospital and is going to have a hearth cath. today. (Sunday) Bill is asking for the church to pray for her and the doctors. Pray that God's will be done in my life. Give me wisdom and knowledge. Tim: thank you for your request. Knowing God’s will is sometimes difficult because it requires patience. It’s natural to want to know all of God’s will at once, but that’s not how He usually works. He reveals to us a step at a time—each move a step of faith—and allows us to continue to trust Him. The important thing is that, as we wait for further direction, we are busy doing the good that we know to do (James 4:17). Often, we want God to give us specifics—where to work, where to live, whom to marry, what car to buy, etc. God allows us to make choices, and, if we are yielded to Him, He has ways of preventing wrong choices (see Acts 16:6–7). Praying for you, knowing He will answer! I wanted to tell you that Ali has been called home by our loving God. He was lost in a robbery during a supply trip to Mosul.. He was 45. His wife, Miriam now lives with us. It is sad way to happen, but I am now blessed with two attentive women who make sure I eat and rest. Even with two women in my house, there is peace, praise God! ok, not always, but usually. We are doing well though I am tired and not well. Our village is safe and growing. We have enough to eat. God is good as you say. My grandchildren surround me each evening to listen to God's word which Ir ead form the Bible. I pray my lessons are taken in and help them become wise. Life is good as our village grows and peace reigns here for now. We are blessed as babies are born and know quiet lives inn safety and plenty. My heart is causing pain but I cannot go to hospital and nearby clinic only gives me aspirin for the pain. Still, I soldier on as long as God wills it. Peace on your house brother! As you so correctly observe, Ali was called home by our loving Lord. We know for the saved, death ushers us into the presence of Christ: \"To be absent from the body, and to be present with the Lord\" (2 Corinthians 5:8; Philippians 1:23). So real is the promise of the believer\'s resurrection that the physical death of a Christian is called \"sleep\" (1 Corinthians 15:51; 1 Thessalonians 5:10). Yet, the circumstances surrounding Ali\'s death gives me sadness, a reminder of the danger in which he and all of you experience both physically and spiritually. Please extend deepest sympathies to Miriam with assurance of our prayers for comfort and grace in this unexpected time of change. So good to hear that the village is prospering. I have often reflected upon the shattering experiences you and the village have endured, wondering how many others I know could have so successfully survived and navigated. You, your wife, Ali and Miriam we hold in such high regard, examples of Saints whom God uses to model for the rest of us the rewards of faithfulness, fidelity and prayer. You are an inspiration, my brother. The Lord uses your example in ways in which you know not. Thank you each for your love and devotion for and to our Lord and Savior. Take care, my friend, as you faithfully soldier on. To tap into God’s wisdom, we must diligently study God’s Word (2 Timothy 2:15), meditate on the Word (Ps. 119:15, 16), pray for wisdom (James 1:5), seek it with all our hearts, and walk in the Spirit (1 Cor. 2: 9, 10). God desires to give His wisdom to His children. Those who have God’s wisdom will show it in how they live: “Who is wise and understanding among you? Let them show it by their good life, by deeds done in the humility that comes from wisdom” (James 3:13). With your sincere prayer request you demonstrate a heart for God which He will honor. Watch as He opens doors for you to walk through, confirming He is guiding your every step (Ps. 85:13). please pray that God will heal my eyes. We are praying for you, Jonathan! I would like prayers to free Lukas Flucht (born on 11 of December of 1988) from a black magic, demonic oppression and curse. I ask you with all my heart to please pray as much as you can, this situation is out of control now. I believe in the power of prayers to help him. You may share this request, just please don't post on website. Please pray for me. I have kidney failure, high blood pressure, a skin disorder that makes me look like a discolored monster with no hair. Please agree and pray that all further testing and breast ultrasounds will be normal and any other testing in my body to come back normal. Please pray that there are no blood clots it all and I am declared healthy. I desperately still need financially, until my disability is approved. I need for, it to approve this week. We must have a breakthrough. I have lost my car this week. And feels like my strength along with it. My children have been helping me financially, but they have their family debt. Pray for God's favor to be on this family. This is all new to me because I worked for 40 years until a couple of years ago. I need all the right numbers on all my blood test so that I won't have to go back to the hospital. Please pray for my strength and victory in my life. My husband has stopped talking to me, and he rather be by himself. I think it has to do with the way I look. But I know prayer changes things. Thank you for praying. Flooding in state has killed over 350 people. The house I moved away from two weeks ago was swept away by flooding yesterday. Also pray for my family and I to do well in Bexeleyheath, UK. My wife has new job as nurse. I am interviewing for jobs as programmer. Our three children are adjusting to new country. I am reading the Bible verses you gave me. I will work on your website later today. Johny: As a church, we prayed for you yesterday and I continue to pray for you and your lovely family daily. I am praying for victor b who has left the faith, is facing the consequences and I pray for his capacity for discernment, mercy, wisdom, and to surrender to seeing that only jesus can save. Is it true that he needs jesus to be the kind of man he wants to be and that I need? I've been impulsively checking tarot and astrology to try and control the situation and my feelings. My fear is inviting satan in. I am praying we are able to not stay in the flesh in regards to our feelings for each other but instead be led by god, something deeper, a capacity for faithfulness, commitment and desire for service. I'm praying to not repeat mistakes in this relationship and that I can love myself enough to really explore my creativity and express myself and my gifts in service to the world. I pray that god, if it be his will, create a committed relationship without obsession or paranoia regarding flirtations or friendship relationships with other men and women, or that he remove or change the nature of this relationship to open the way for another holier, more healthy one where my partner sets the boundaries I need them to set. I pray that victor know the depth of my care and admiration, because I have had difficulty expressing it. in jesus name, amen. Please pray for peace in the Frazier family. His mother has contracted Creutzfeldt-Jakob disease. She is in the hospital at Johns Hopkins. They have called hospice in. He is praying that she does not linger in her suffering. Please put me on the prayer list I went to my heart Dr. today and she told me that my heart rate is very low now it is going to be up to God now. Art was admitted to the VA hospital this morning with fluid on his lungs making breathing difficult. He has not done well since yesterday. I am concerned because he is going downhill again. 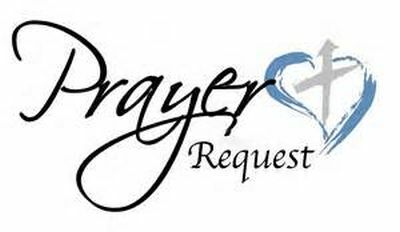 Click on + Add new to add a prayer request. Pastor will be notified.